Europe’s cycling industry now employs more people than mining and quarrying and almost twice as many as the steel industry, according to the first comprehensive study of the jobs created by the sector. Some 655,000 people work in the cycling economy – which includes bicycle production, tourism, retail, infrastructure and services – compared to 615,000 people in mining and quarrying, and just 350,000 workers directly employed in the steel sector. 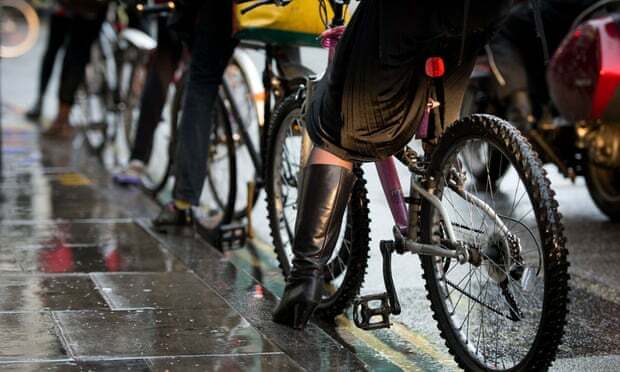 If cycling’s 3% share of journeys across Europe were doubled, the numbers employed could grow to over one million by 2020, says the ‘Jobs and job creation in the European cycling sector’ study which will be published next month. The study, which the Guardian has seen, finds that cycling has a higher employment intensity than any other transport sub-sector. Growth in the cycling economy should thus have a higher job creation potential than in the automotive industry for example, which employs three times less people per million euros of turnover. Surprisingly, the lion’s share of jobs in the new free-wheeling economy are in bicycle tourism – including accommodation and restaurants – which employs 524,000 people, compared to 80,000 in retail, the next highest sub-sector. In general, cycling jobs are more geographically stable than other sectors, and offer a more inclusive and easily accessible labour market for low-skilled workers, says the new report, which was produced by the Transport and Mobility Leuven research institute. The study also signals some unexpected knock-on benefits that bikes can have for local businesses. Cycling “contributes probably more to the local economy than the use of other transport modes,” because “cyclists go more to local shops, restaurants, cafes than users of other transport modes,” the paper says.